Throughout downtown Rochester’s core neighborhoods, which date back to the turn of the 20th century, some of its most valued treasures lie. These are the homes built when the city boundaries first expanded beyond St. Mary’s Hospital and the Zumbro River. With unique interior wood craftsmanship, elegant windows, and hardwood floors, these homes, if preserved and maintained, are a living, breathing time machine into the past. Sadly, over the course of decades, many of these historic buildings fell into disrepair, were foreclosed, abandoned or converted to multiple level apartment complexes. Others required renovations their owners could not afford. As these houses deteriorated, so did the look and feel of the neighborhoods throughout the 1980s and 1990s. The Kutzky, Slatterly, and Eastside neighborhoods had lost their grandeur and needed serious attention from the community to return to their former glory. “The neighborhood was populated by transient students and a few drug pushers; most of the larger houses had been converted into multi-unit buildings by indifferent, absentee landlords. There were very few families with young children. We found that we could afford our house, but it had been neglected for years—storm windows and screens were missing. 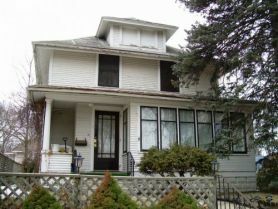 It had a leaky roof, substandard plumbing, inadequate electricity, peeling exterior paint, and grass overrun with weeds. That would have described a majority of houses in our block. As we started fixing up our house, a few others were getting repaired as well. We were still overrun with drug pushers, loud cars and parties, trash strewn about buildings, car thefts, and a raft of absentee landlords who exploited the peace of the neighborhood for as much rent as they could get without restoring or taking care of their properties. The transformation began in 2004 when First Homes and its Heritage Homes initiative started purchasing foreclosed and blighted homes in these neighborhoods. With funding from dozens of community partners including local banks, businesses, and Mayo Clinic, First Homes purchased 53 houses over the course of 10 years and began restoring the homes with new electrical, plumbing, mechanicals and exterior upgrades. Once renovations were completed, the homes were placed in First Homes’ Community Land Trust program (CLT) to make them affordable for families. The trust allows the buyer to purchase the house while leasing the land from First Homes. It creates a smaller monthly mortgage payment that appeals to buyers who, many times, are buying their first home. 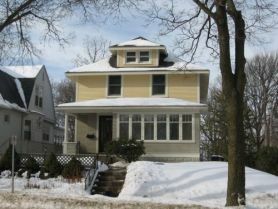 Along with offering more affordable housing options in Rochester, First Homes’ Heritage Homes initiative has helped these neighborhoods come alive. “The Heritage Homes program has made the same difference in all of the neighborhoods where they wisely invested community funds, leveraging them into desirable homes with increased property values and quality of life for all neighbors,” says Podulke.